An honest police office alters his principles and morals to give corrupt politicians and criminals a taste of their own medicine. He's the 'combo' offer. He is a gunda and a good guy! He's drunk from last night's booze, yet buys more, cleans his teeth with the alcohol, mixes it with idli like you would sambhar, and then washes his hand with what's left in the bottle. Strictly for Sanjay Dutt fans! 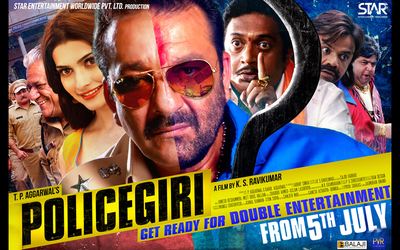 Policegiri is a combo of bad and ugly. Buy a ticket and get migraine for free! Sadly Policegiri mein naa kaam hai naa naam! You are presented with Sanjay Dutt who is well past his hey days and looks jaded and tired as a Robin Hood type inspector, to top it all the movie is a remake of south superhit Saamy which was made well over ten years back.